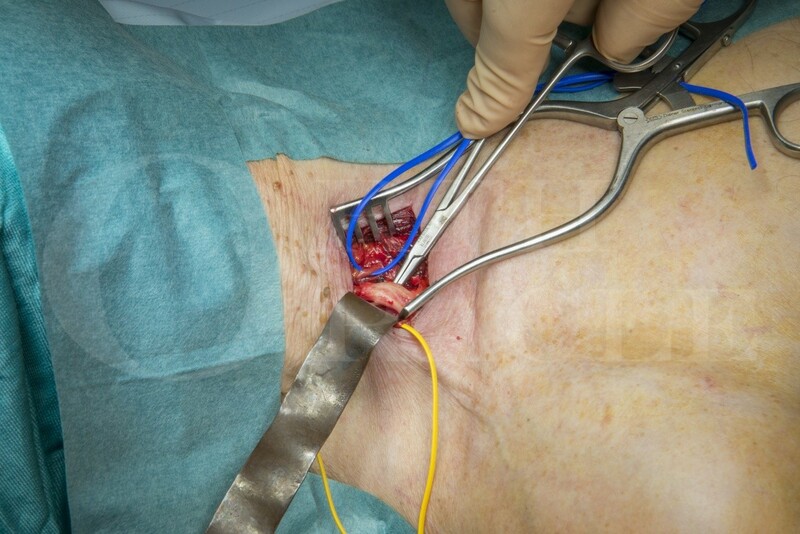 Learn the Brachial plexus exploration and long thoracic nerve decompression surgical technique with step by step instructions on OrthOracle. Our e-learning platform contains high resolution images and a certified CME of the Brachial plexus exploration and long thoracic nerve decompression surgical procedure. The long thoracic nerve arises from the C5,6 and 7 roots in the neck and passes posterior to the brachial plexus across the lateral border ofthe first rib to enter the costoclavicular space. The anatomy has many variants and these abnormal innervation branches render the nerve susceptible to traction injury, compression or iatrogenous injury. Long thoracic nerve palsy results in paralysis of the serratus anterior muscle with loss of scapula stabilisation, elevation and rotation. Diagnosis of the condition is straightforward due to the obvious wasting of the muscle and the winging of the medial border of the scapula on arm lateral and forward elevation. The underlying pathology is difficult to diagnose. Common causes are neurogenic from viral neuritis, injury, traction or compression. Neuritis may have a painful prodrome and wider changes within the plexus on electormyography. The differential is myopathic winging due to primary motor pathology and weakness. EMG is useful in diagnosis and planning surgery. Tenderness over the course of the nerve at the scalene interval in the posterior triangle , the apex of the axilla or the mid-axillary line can guide the surgeon towards the primary site of pathology for exploration and decompression. The case presented here had tenderness over the scalene interval and the lateral border of the first rib and so the first part of the decompression was to explore and stimulate the nerve origin and proximal course in the neck.